As the end of the May month nears I begin thinking of Summer with it's long nights and warm days. The scene of light flowy dresses and tanned glowy cheeks is what comes to mind. What comes to your mind when you think of the warm months ahead? 1) Choose a suntan lotion with SPF 15-45! I know that this sounds alot like the opposite of getting any color but lets not forgot how detrimental the suns rays can be for our sensitive skin. So slather that stuff on and opt for some faux glow! Read about my sun protection tips and the bad personal experience I had that made me a true sun protection believer here. A great one to try is the Sun Bum SPF 30 Sunscreen Lotion $16. 2) Use a self tanner- I'm surely not the first to talk about self tanners and I know I won't be the last because they really are that good for faking a gorgeous tan. There are several tutorials on how to use them all over the web from blogs to youtube so you'll have nothing to worry about when it comes to getting the application just right. I personally opt for gradual tanners since I have such pale skin. My favorite is the Jergens Natural Glow Firming Daily Moisturizer for Medium to Tan Skin Tones. One I have yet to try but have heard rave reviews on is the St. Tropez Self Tanner Mousse which is supposed to deliver long lasting color along with an easy application and lightweight feel which is just what I like in a self tanner. I look forward to putting that to the test that is for certain! 3) Bronze and Highlight with Makeup products- You can start with a luminizing base if you like which will just take that glow a bit further. For a light coverage look the Smashbox Sheer Focus Tinted Moisturizer is one I like alot. Once you have perfected and neutralized the skin as needed you will want to add back some color and definition and you can do so with a bronzer and highlighter. My most used bronzer of the moment is Nars Laguna Bronzing Powder- it gives me the perfect sculpted bronze look and doesn't look caked on or orange. Using a large fluffy powder brush focus on the points where the sun naturally hits like the hollows of the cheeks, over the nose, top of the forehead and underneath the jawbone. Working in circular motions will give the most even and natural finish and keep it from looking too sculpted. Lastly, lightly apply a highlighting product like The Balm Mary Lou Manizer to the high points of your face including your cheekbones, temple, bridge of the nose, just above the upper lip and on the brow bone. This step will complete your glowy skin look. 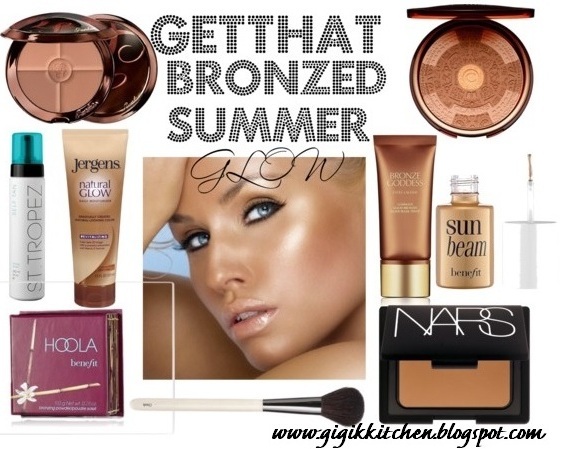 What are your favorite products for getting that perfect summer glow? Do you have any tricks for achieving the look? Let me know in the comments form below! It's always good to hear from you! Hope this beauty tip will be useful to you in your beauty routine as Summer nears. Have a very nice Memorial Day and a great start to the new week!